If you wish to extend your marketing campaigns across the Swiss market, Blue Mail Media can help you achieve greater traction in your promotional campaigns. We provide business organizations with one of the most accurate and reliable Switzerland Email Database which enables them to connect seamlessly with key decision makers across Switzerland. Blue Mail Media’s team of data scientists, experts and researchers put immense efforts in accumulating high quality data from numerous sources, verifying it for accuracy, and constantly updating the same with latest data, so that you drive seamless interactions with your target market with minimum hassles. Using Blue Mail Media’s Switzerland Mailing List, you can reach out to your target market passing through minimum communication gateways in the chain of communication. 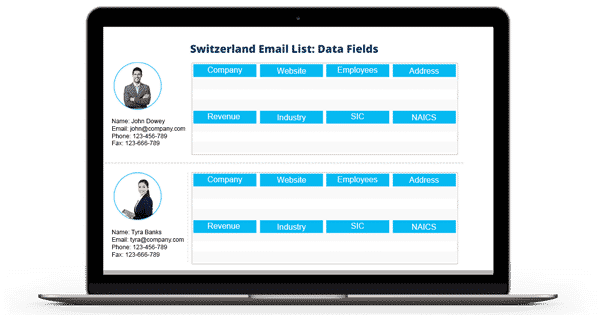 Our list of Swiss Business Executives’ Email Addresses gives your sales team complete access to relevant information to connect with your B2B customers via telephone, email or mail. We follow stringent data collection, verification, and update process to make sure you achieve a higher response rate as well as conversions. Also, Blue Mail Media believes that all business organizations cannot be served with a single approach, and so, we offer our clients to choose from our pre-packaged Switzerland Business Executives Database or get a customized list based on their marketing specific requirements.